AfriCity closely interlinks research, teaching and training. In order to involve and to encourage young scientists, we are providing full scholarships for Masters students (M.A./M.Sc./M.Ed. or similar) for a short-term study stay at one of our partnering universities. African students are welcome to participate in courses and other learning activities at the Institute of Geography, University of Erlangen-Nuernberg (FAU), Germany. 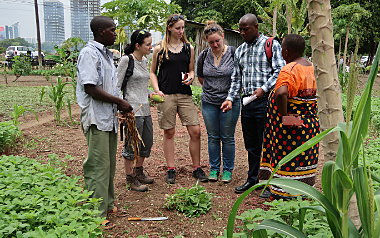 FAU Geography students will be hosted by Sokoine University or CBE (Morogoro or Dar es Salaam, Tanzania), the University of Malawi (Zomba, Malawi), or Rhodes University (Grahamstown, South Africa). To be eligible to participate in the exchange programme, you must be registered as a student or a research assistant at the AfriCity partnering department of your home university. Interested? Contact us and/or apply now! AfriCity also promotes transnational cooperation and networking of scholars, and includes training components for practitioners from thematic fields related to the project’s topic. Moreover, AfriCity contributes to urban citizens’ and other stakeholders’ understanding of the project’s topics and, reciprocally, lets them share their perceptions, attitudes and practices, thus facilitating an ‘ownership’ of their urban living environment beyond the duration of the project. training needs analysis (TNA) with regards to GIS and Remote Sensing, various participatory teaching activities "in the field"